This script will add a silence gap between songs when playing through MediaMonkey's built-in player. It does not modify files in any way. It can be enabled or disabled, and gap length can be set from 1 to 15 seconds. When enabled, it disables crossfade and saves its state. When disabled, crossfade state is restored. - Disable: [ ] "Remove silence at beginning / end of track"
Info specifying "Gapless Track" must previously be entered (in one of 5 Custom Fields) for each track you don't want a delay at the end. You set in the options which Custom Field and what value to use. The value can be anything you like (minimum 1 character/digit) and can be position anywhere in the field. For example, you could append it to the end of Custom3 field, and still use TiedSongsGroups script (which also uses Custom3) without needing to use an additional custom field. The script checks this info when track starts playing, to minimize processing time when the track ends. Tagging the gapless tracks should be easy and straightforward to do. Select all tracks (except last one) of a gapless album and set Properties at once. System Requirement: V1.0 of the script requires MM 3.1.0.1218 or newer to work. V2.x requires MM 3.1.2 or newer. Vista/Win7 users need to install it with administrative rights (see here). 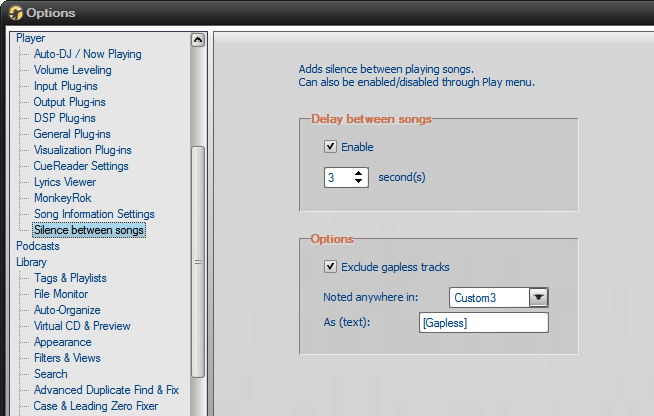 2010-12-26 - v3.0 *NEW* - Now can automatically skip the delay on gapless tracks. 2010-05-01 - v2.2 by Eyal. Tweak to stop playing after Shuffle has played all tracks when Repeat is off. 2010-04-29 - v2.1 by Onno Tabak. Code enhanced to take care of Repeat and Shuffle. If pressed PLAY during the gap, next song is started immediately. 2010-04-21 - v2.0 by Onno Tabak, with a small part of Gap.vbs by Soren Werk. Code use StopAfterCurrent and triggers a silence gap. 2009-09-17 - v1.0 by Eyal. Code uses loops to pause after playing song. Last edited by Eyal on Wed Dec 05, 2018 1:33 am, edited 12 times in total. By the way. What skin is that? Nice and clean script. Well done, Eyal! It took me a while to get back to the forum and find your gift. It's the best Christmas present I received. Thank you so much for your script. One suggestion, for dummies like me you might include instructions for installation. I had to do a search to find out what to do with the file. But I found it and it worked like a champ. Perfect dude, just what I was looking for. I added a link to DataFileHost, in case you can't download the file from MediaFire. Thank you so much. I am studying language and in the audio words i need time between them to repeat them and learn. I was so anxious to find something like this. This is just perfect. THANK YOU!!!! After a an almost complete rewrite of that script I found this one with configurable options. It ran into the same problems I had while testing and rewriting the other script. At the start of the next song a couple of seconds was repeated. Probably a problem with the buffer. Other output plugins didn't help. So I started merging the two scripts. I found the solution in making sure that the song was stopped at the end, which triggered a silence gap before starting the next song.
' 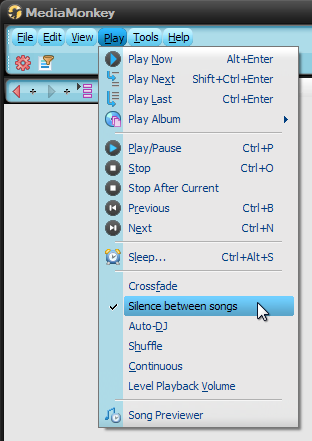 enable/disable a silence time between playing songs.
' Delay time is configurable through Options|Player|SBS.
' Requires MediaMonkey 3.1.0.1218 or newer. Dim AppTitle : AppTitle = "SilenceBetweenSongs"
Dim Version : Version = "2.0"
MenuItem.Caption = "Silence between songs"
GapProgress.Text="Gap " & SilenceTime & " seconds." GapProgress.Text="Gap " & SilenceTime - GapProgress.Value & " seconds." "Can also be enabled/disabled through Play menu." oPanel1.Caption = "Delay between songs"
Thank you onnotabak, it's working. The only drawback is that this code doesn't take into consideration when Shuffle and/or Repeat is ON. It stops playing after last track of NowPlaying list has been played. onnotabak wrote: At the start of the next song a couple of seconds was repeated. I'm not sure about it, but I think it's caused by some DSPs buffer. I get an Product Installation Error with this script. MediaMonkey Version 3.2.0.1294. It does show up in the Extensions pane, but nothing displays in the Options pane. Any suggestions? I really need this function for classical music.